Hi all, completely new here and first post, but I had been lurking for a week or two. I'm looking in to starting to make my own soft baits. Ive read, searched a lot and watched a lot of videos on youtube. Have a few quick questions which are probably obvious to you guys but I haven't been able to find the answers to. First: hardner and softner. The plastisol I ordered comes in hard, soft, and medium already on its own. With this stuff, do I REALLY need hardner and softner? I understand they may allow me to fine tune, but I'm looking to just start out as simply as possible right now. Heat stabalizer: REALLY required? I've watched a ton of videos and don't think I've seen a single one in which heat stabalizer was used or mentioned. What exactly does it do? The descriptions I see are always super generic "stabalizes plastisol during heating". I'd like to know what the exact effect is. Keeps it softer? Keeps it harder? Keeps color retention? Or....? Glitter: what would you consider the "average" size or is there a happy medium that would work with many different baits (senkos, neds, swims)? If you already bought hard soft and medium plastic you shouldn’t need hardener or softener unless you want the finished products harder or softer than what you have, those are personal preference. heat stabilizer helps prevent scorching the plastic if you get it too hot, also helps with color retention. I would say the average or medium size glitter is .035 or .040 depending where you get it. I prefer small glitter in most baits (.008 and .015) but that’s just me. .062 would be your large. also heat stabilizer is needed much more with the color white and a few other lite colors. these colors show that you burned it way more than any dark color. That being said you need a thermometer to make sure you do not over heat it . lightly stir very often while heating to stop hot spots. Like @Canga~, I prefer glitter in a .015 size but I have .035 also. I pour a lot of baits 3" and under, and anything over .035 seems really big. Nothing wrong with having a nice mix though. I use heat stabilizer a good bit because I do a lot of reheats. Most of my molds make 4 baits or less at a time so thats the nature of the beast. I also pour a lot of lighter colors(white, light gray, light green) so it helps keep the bait from yellowing and keeps the color correct. I think I bought 8 oz. of heat stabilizer and because I pour small batches (4-8 oz of plastic) it will last me a pretty long time. You only need a little bit when you reheat. I pour medium plastisol because I mainly pour swim baits, grubs, paddle tails and jerk baits. 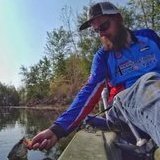 I do pour some stick baits and I think a lot of people like a softer formula for those but I like the action I get from medium, plus I don't add salt either. You can get hardener and softener but if your starting out you probably don't need it right away. It really depends on what you are pouring and what action you want. I am with @Bass-Boys, definitely get a thermometer. I got a cheap IR thermometer from Walmart and it has allowed me to get much more consistent pours. 1- Heat stabilizer is a good thing on reheats you need it and a little raw plastic with that said to much is a bad thing it’ll make your baits stink and it will turn your plastic a yellowish color. 2- when using hardner you should add heat stabilizer if your using paste type. If your using the hardner from MnF you don’t need to . My preference is paste type hardner. 3: when using softner I don’t use heat stabilizer . Reheats of 4 oz of plastic with a little raw plastic added 4 drops of heat stabilizer works for me . Thanks guys! I think that pretty much sums up my first questions. I have already gotten a ir thermometer along with a heat gun at the local harbor frieght. One more quick question - is it OK to do this in a cold environment? I live in a smallish 1 bedroom townhouse and from what I've heard this can give off quite the smell, and I don't want my wife griping about it. I do have a garage, however the outside temp is currently in the high 20's/low 30's. I can set up a space heater but not completely sure how much of a difference it will make in an open garage. Is it worth giving it a go or will the mix cool to quickly to inject? I would not cook soft plastic indoors. The fumes are very unhealthy. I also would not cook indoors, as said above the fumes are not good for you and depending on what plastic you got this sycamore flat out stink! get yourself a forced air heater. I got a 60k btu Master branded propane model from tractor supply and it works great, I pour in my garage with the door and window open and the 60k on 1 or 2 (out of 3) keeps me nice and toasty, as well as making a nice way to heat up you molds while your plastic is cooking, just hold the mold in front of the heater for 30 seconds or so and it’s good to go! I also pour in a garage, temps right now are 20s-30s here too. I just use a space heater to heat the garage, open a window and the garage door. I use a toaster oven to heat my molds and injector but thats because I already had one for curing powder paint.